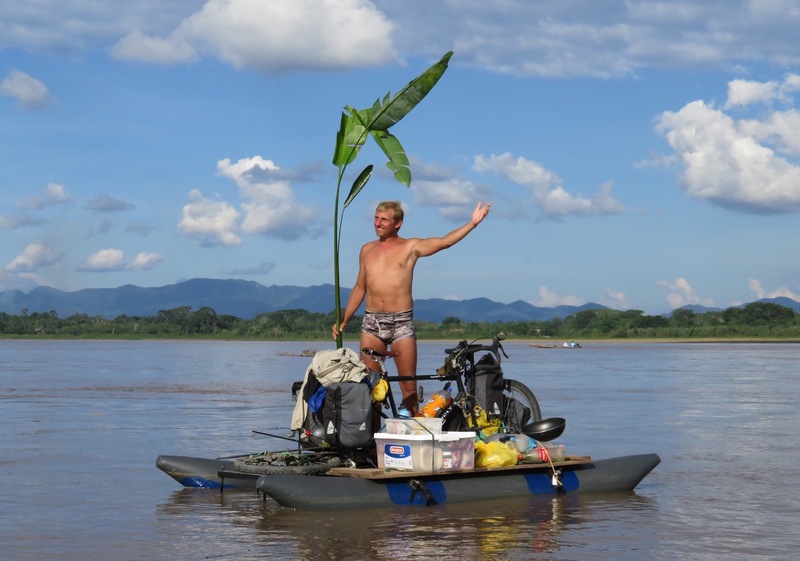 David Andres and Hubert Kisinski, who has been traveling the Amazon on bikes by land and water for three months, accomplished the next stage of their journey. 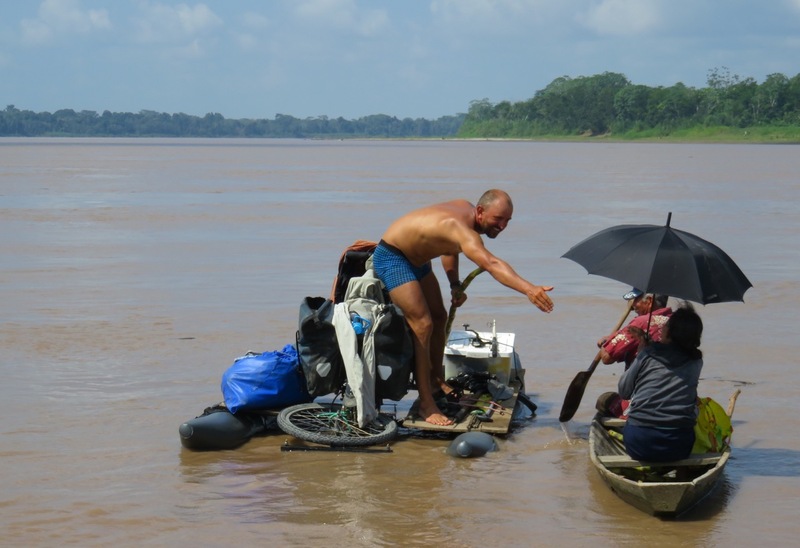 After leaving the town of Pucallpa, they pedaled along Ucayali *, which is the longest tributary of the Amazon River, stopping in towns Contamana and Iceland before they reached the Puinahua Channel. 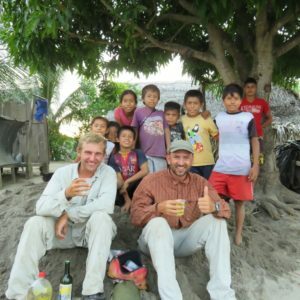 After covering the channel they stayed on the mainstream Ucayali again, which took them into the town of Requena, and then to another large tributary of the Amazon – Marañon River. In the town of Nauta they dismantled their Amazonian bikes, packed the parts on their traditional bikes and by land biked to Iquitos. 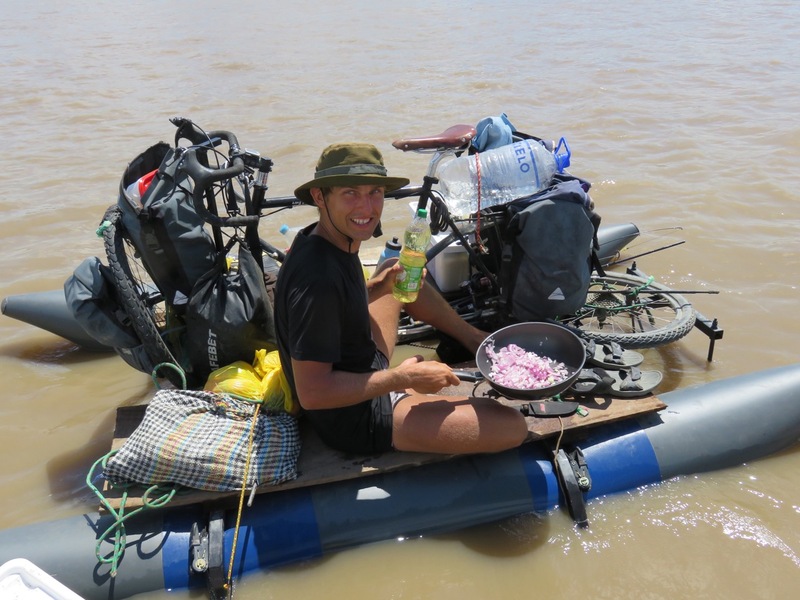 David Andres and Hubert Kisinski who for three months traveled the Amazon on bikes by land and water, accomplished the next stage of their journey. After leaving the town of Pucallpa, they pedaled along Ucayali *, which is the longest tributary of the Amazon River, stopping in towns Contamana and Iceland before they reached the Puinahua Channel. 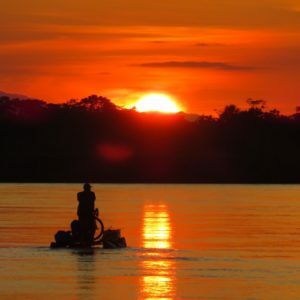 After covering the channel they stayed on the mainstream Ucayali again, which took them into the town of Requena, and then to another large tributary of the Amazon – Marañon River. 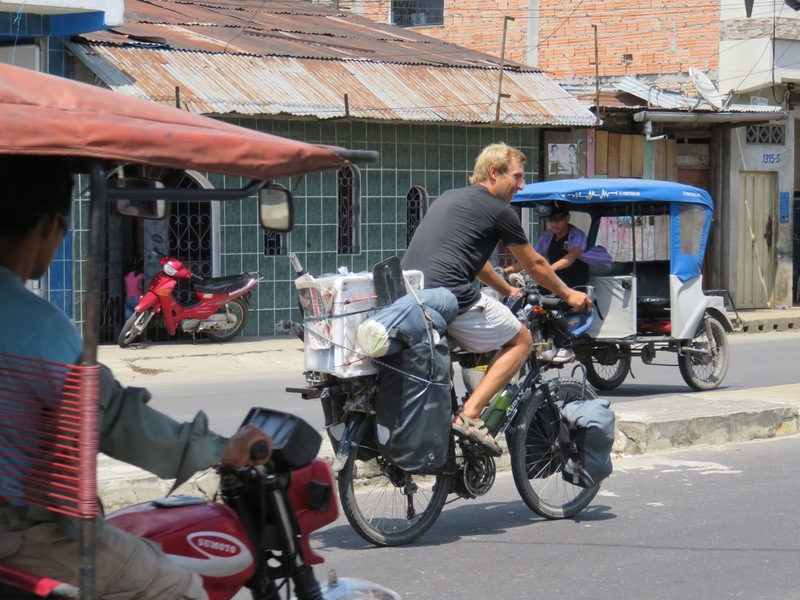 In the town of Nauta they dismantled their Amazonian bikes, packed the parts on their traditional bikes and by land biked to Iquitos. * Actually, individual sections of Amazon carry different names derived from its respective tributaries, starting from Lake Ticlla Cocha (permanent source of the Amazon) through Carhuasanta, Lloqueta, Challamayo, Hornillos, Apurimac, Ene, Tambo, Ucayali, Salimoes (for Brazilians), and finally to Amazon. The next leg of the journey started quite nervously. 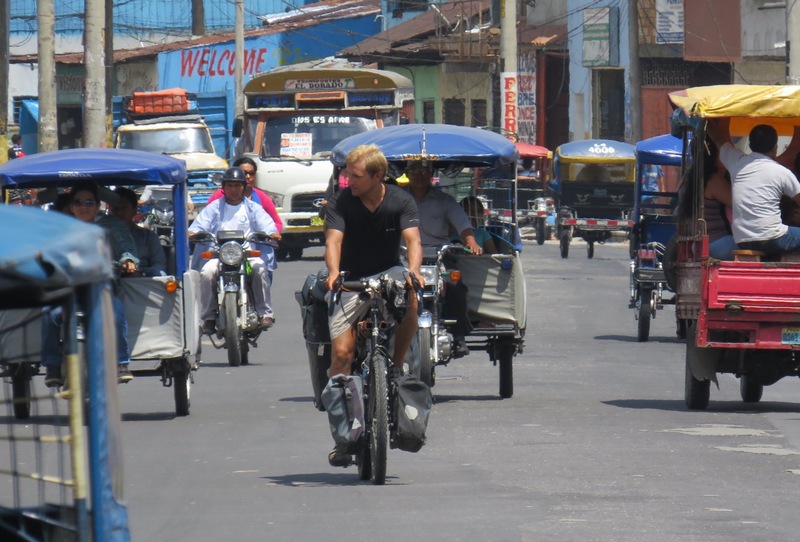 Shortly after leaving Pucallpa David felt something unusual in the drive of his bike. Although they had one spare drive, that was barely enough in the case of malfunction for two bikes, and for more than two weeks runoff, and additionally this spare one wasn’t in the best condition. -From the first day I felt that drive in my bike is falling apart, something wasn’t right, it didn’t respond well. Every time I had to think hard before making any movement, says the elder of brothers. This section was very tiring mentally for me. I worry about a lot of things and even more in anticipation. Even now I already wonder, for example, how we will move on these bikes of ours to Belem, which is the final stage on the water. This is quite unlike Hubert, who has very optimistic approach to the issues and is able to wait calmly for what fate will bring to him. The drive died after 10 days. Fortunately – and according to the brothers, even “super lucky” – they just reached the village, where they planned to spend the night. 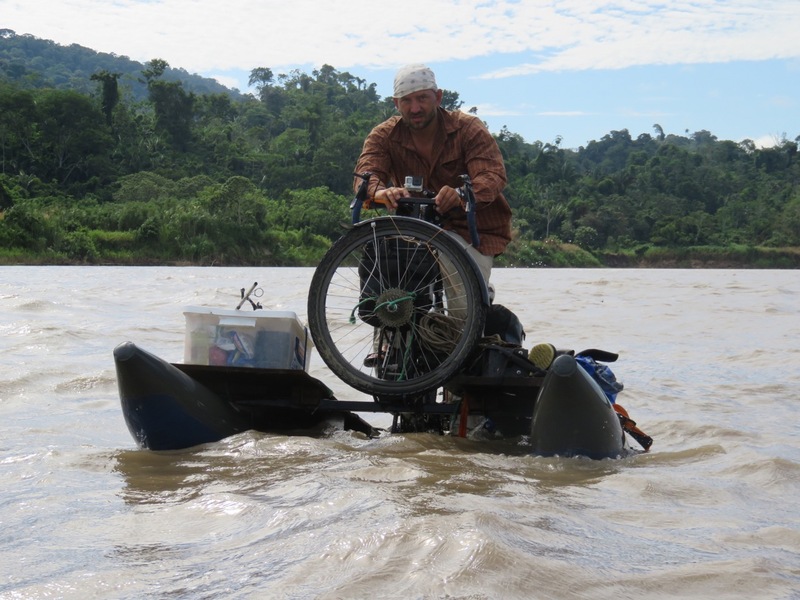 Bringing the broken bicycle from the middle of the river would require a lot of effort. They installed a backup drive on David’s bike and the next eight days of the trip prayed that it would not be another failure. After getting to Iquitos they equipped themselves with six additional drives, so together with the repaired one they had seven of them. 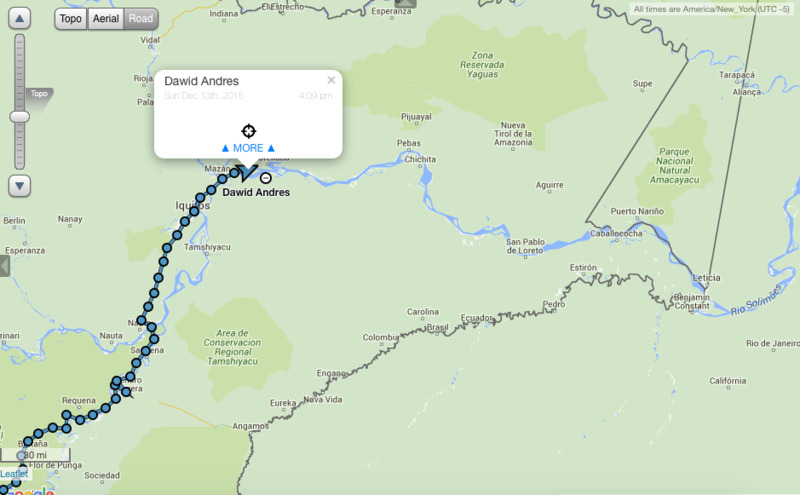 To Manaus, nearly 2,000 km ahead it should be enough. Out of nowhere, suddenly they appeared on the river; long waves at around 50 meters. The were coming up, one after the other, undercutting our Amazon bicycles, almost attacking them, and rising them high up. Intense pedaling was practically pointless, water carried us as it wanted and where it wanted. After a moment, it suddenly calmed down and continued its gentle course. The sensation was interesting, but surprising. 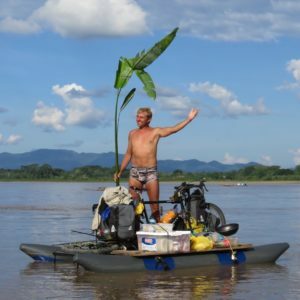 David and Hubert were expecting considerable waves on the Amazon, but rather closer to the Atlantic, which is still a few thousand miles ahead. What was that about? – They wondered. They finished off at the shore of Perillo, where, as always, a crowd of curious villagers greeted them. David felt a little uncomfortable as if he was still sitting on his bike in the middle of the wavy river. – You know Hubert, I still feel those waves on the water, and for some reason I feel dizzy – he said to his brother and at that moment a powerful jolt shook the ground, accompanied by a loud bang. People began to shout, “Terremoto! Terremoto “(Earthquake – in Spanish) and flee in panic. Just where to run?! For a moment there was another tremor, causing even more confusion. In the chaos could be heard the reassuring voice of Haglilla, a 45-year-old Peruvian, a local teacher, advocating to stay in place and wait out an earthquake here, where it is a lot safer than among the buildings of the village. Only the children obeyed, the rest fled. – So hence these waves – said the brothers, who had just survived the first earthquake in their lives. And it was the powerful earthquake, at the strength of 7.6 on the Richter scale. Impression of monotony on the Ucayali also caught up with David and Hubert. Wide, great, river, that seemed to have no end, evoked a sense of isolation from the world and removal from the reality. Days seemed indistinguishable from each other; similar scenery – the brick red water and on the banks bold areas without trees, the same sounds of tree-cutting machines. Here you can actually see the extent the lumber industry is spoiling the Amazon jungle. – We live almost all the time on bicycles – says Hubert. – We get up at 5 in the morning; pack up and usually at 6:30 start pedaling. We even do not eat breakfast on the land. I prepare breakfast on the bike. Water carries us, and I fry something on the little pan. Hubert seems to be not only to be a “handyman” fix everything-capable person, but also a good cook. He quickly learned how to bake fish on a scaffolding of bamboo, although the real spécialité de la maison is … rice with scallions. The brothers say that there are days when they do not see people for long hours, no villages; nothing but water. – Well, sing on the river, one in the morning and the other one in the afternoon – I suggested in jest. They said that it is enough that in the Ucayali fish sing; as aboved mentioned Fiedler reported before. The singing fish called corvina brings, according to the writer, a special impression to the one having chance to hear it. “Sometimes at night you can hear the amazing sounds of the water, reminding chiming bells. 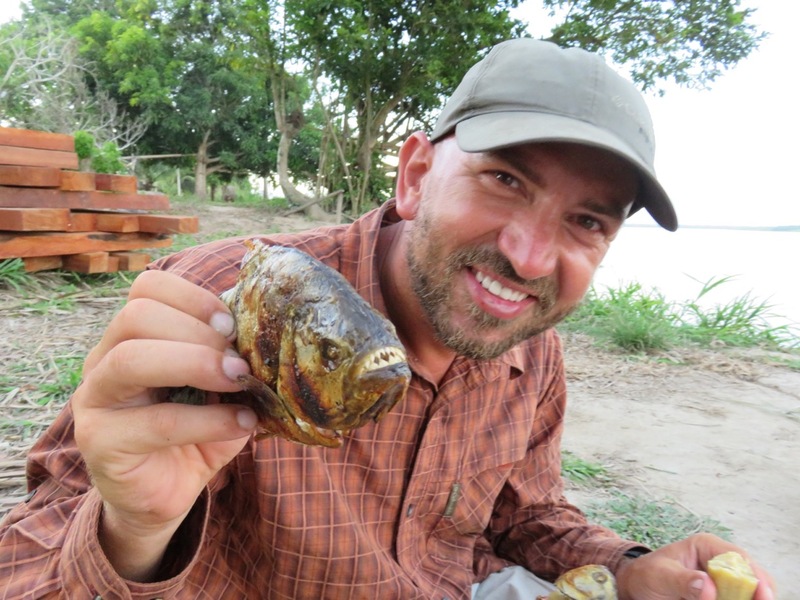 Some fish, similar to catfish, bewhiskered and of cylindrical bodies, sing in Ucayali. […] The singing was so quaint and harmonious, this phenomenon was so unusual that involuntarily it caused the mood of dreamy hallucinations that is often experienced a concert hall.”- he wrote in his book. 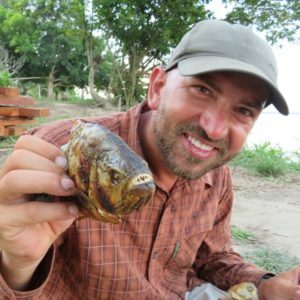 – The fish in Ucayali actually do not sing, they just talk – said Hubert. – And it is believed that fish don’t make a sound… . One night we heard the noise around us. We looked, and if appeared those were fish, picked up one, and this creature was talking to us! They usually talk around 11 o’clock at the night. 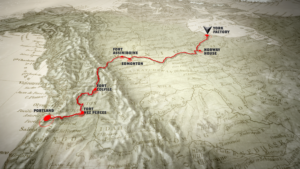 The travel through channel Puinahua provided the brothers a break from monotony and extraordinary experiences. Here you can enjoy a real lush green jungle, about which they read in the books and listen to the all-encompassing silence, from which gradually began to distinguish the sounds of a tropical forest trees, birds, and animals. Here, they indulge in their isolation from the outside world and the isolation from the people. Never navigate the river at night! That day David and Hubert were determined to get to Requena. At about 6 pm it seemed that the town was close because the signal on the mobile phone became available. At about 6:30 the river was enveloped in complete darkness. The moon wouldn’t be out for another 6 to 7 hours. Nevertheless, the brothers decided that they would try to travel at night. Hubert found out from GPS, that they were about 14 km from their destination. They couldn’t see anything. The only lousy beacon was the line created by the outline of trees on the banks. 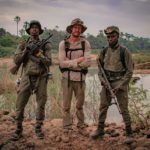 – We got a text message from you informing us that in 10 km we should see the first lights of the harbor and within another 15 minutes we would reach the beach suitable for setting up a camp for the night – David told me later. – We looked around. It was very dark and no beach in sight. I suggested that maybe pull to the shore and look for that beach and wait out until morning. But Hubert said that we should proceed to the town; so we did. Fifteen minutes later, they saw the lights. They traversed to the other side and … the lights disappeared. It turned out that they hit the bend of the river widening to about 3 km and changing their position relative to the port. The GPS speed check of the river current showed no speed at all. 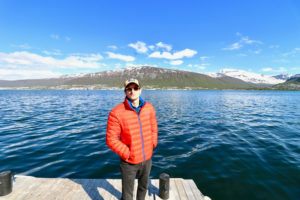 – It turned out that they got to a standing body of water. In the darkness it is hard to know which way to move. I have a poor sense of direction even in the daytime, let alone at night in the middle of the jungle! So I was really annoyed at Hubert that he pushed us to get to the city! I was ready to tear his head off – says later David laughing. They pedaled on. Finally, somewhere in the distance they saw a faint light from the barge. The fisherman told them that soon it would be the entrance to the city. – But this is Peru. Already we have seen repeatedly, what “soon” means in this culture – it could just be a minute or a few hours – comment the brothers. This time “soon” was really only 10 minutes and light actually appeared to lead them to the port in Requena. It’s just that Ucayali, like the entire Amazon, in their characteristic way change the course so much that at some point they had to move against the current on the section of the Rio Aleman. For some time, it has become a connector between the city and the main river. 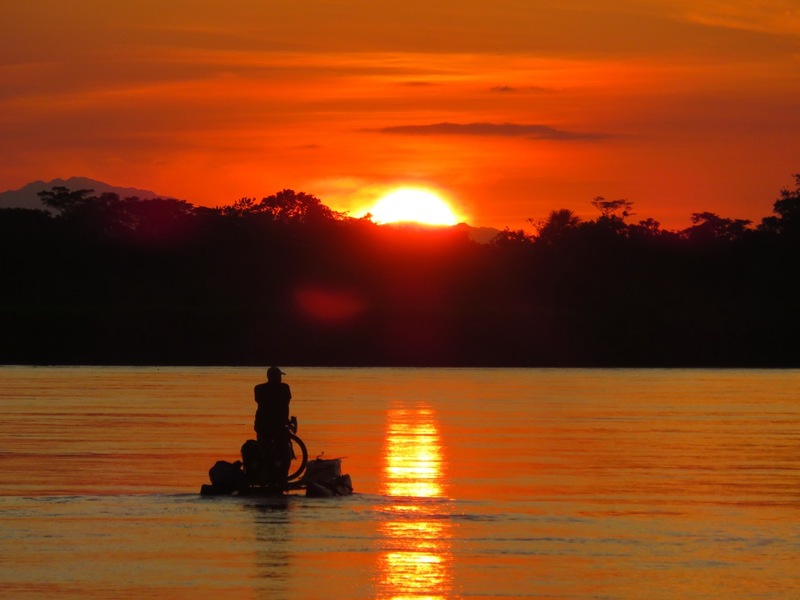 When along with Joe Kane we kayaked that part 30 years ago during our Amazon expedition, Requena was located directly on the banks of Ucayali. – You see Piotr, now thirty years later, the river is pulling our legs; you see, it was easier then – I heard in response, accompanied by more laughter. 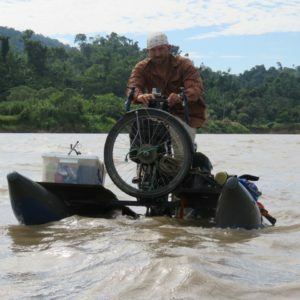 In Nauta, a town situated on the Maranon River, David and Hubert dismantled their water bikes, attached the wheels to the framework and set off overland toward Iquitos. After a few weeks of pedaling on the water, it was a big pleasure pedaling on land. After the mountain, or rather high mountain crossings through the Andes, the road from Nauta seemed almost flat. On the way to Iquitos they stopped for cookies and pizza at the house of Polish painters residing in Peru for last six years. It was a big surprise to Ewa and Tomasz Cisowski when two compatriots unexpectedly knocked at their door. 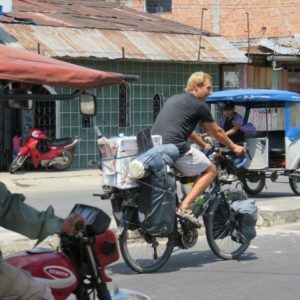 The news about the Poles biking the Amazon not only carries a wide coverage in the Amazon basin, but also spreads ahead of them. – We reach the vicinity of the village and hear how people gathered on the shore are calling to us Polaccos, Polaccos, or even address us by our names – the brothers are overwhelmed with heartfelt greetings. Crowds of residents accompany them at every stop. The rule is that a designated leader conducts the preliminary discussions with the visitors. It seems that bystanders do not leave the gringos’ camp and their vantage point, even for a moment. They are there when the cyclists fall asleep in the evening and their voices outside the tent are waking them up in the morning. The friendly attitude of the brothers, their openness, honesty and cheerful smiles enlist them to almost everyone. Thanks to these personalities, the brothers can easily find a place to camp, often combined with a treat from the locals, who are happy to chat with the already famous Poles. David and Hubert emphasize that it is a perfect way, to meet and learn about people, the country, its culture, not mentioning to practice their Spanish language, which is improving from day to day. – Many expeditions enter the Amazon with Navy bodyguards, or a group of guides, which not only is isolating them from the indigenous people of the region, but also disheartens them toward the visitors. 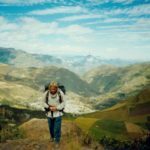 In many articles we read about the risks tourists can encounter in these areas and traumatic experiences of the travelers, which causes that others, omit the region from afar. From Pucallpa we were entering the villages, which have never seen tourists, hence surprising their residents. Felipe, our Ashaninka guide convinced us that we should not be afraid of the locals. Here operates a simple rule of reciprocity: we are friendly toward them and they are accommodating us – state the travelers. The brothers especially remember Jeff, whose house became their base in the midle of the night around Requena. He protected their equipment, helped to organize the accommodation, for which he even wanted to pay. For good-bye he gave them a handsome catfish. – Two hours after the departure from Requena the boat approached us. We look, and it is Jeff. He puts into our hands the package with fruitcake and says: Guys, this is for you, for the holidays. He had made a special trip to give us a cake – his comments moved David. One day, when brothers pitched their tent away from the village, a man appeared in their camp with a gun and a big bag. For a moment they looked at each other with surprise. Local surprised to see white people, the brothers – intrigued, and maybe a little concerned seeing a shotgun and a bag. Imagination suggested many different interpretations regarding this situation. 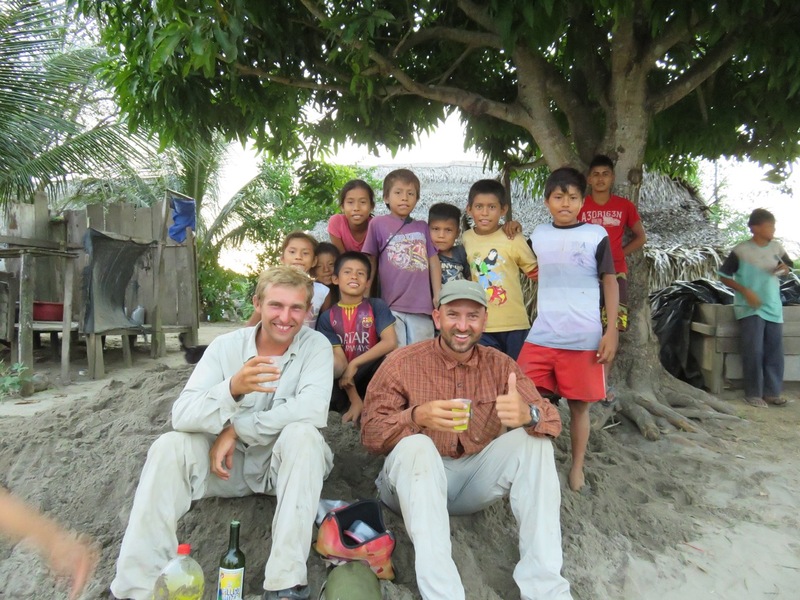 Immediately they remembered their Peruvian guide, Felipe, who kept them company on the road to Pucallpa; he was using his machete to catch the fish instead of a fishing rod. – We asked if we could buy a couple of fish from him. He reached into the sack and presented us with three handsome ones. He did not accept any money. The fish were delicious. – The truth is that it was our fault; somehow during the trip we let our guards rest. Too bad, we lost a good and expensive camera. – says David. – And, intelligent and sympathetic thieves took those 200 soles because they did not take all 700. It was though to report this robbery at the hotel where it happened. And this is the way the cyclists are shaping new categories of offenders in Peru, because either they encounter crummy gangsters on a mountain stretch* or sympathetic thieves. 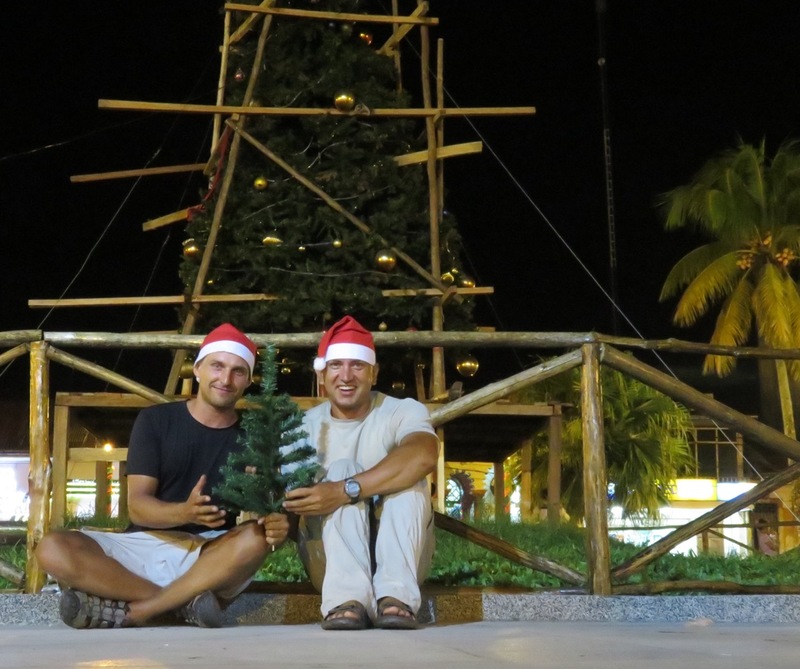 In Iquitos you could feel already a festive holiday atmosphere. There were Christmas trees, to the considerable consternation of Hubert who wondered how Christmas trees, conifers made it to the jungle region. The brothers will spend their holidays probably somewhere on the river. 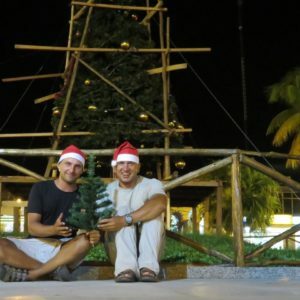 They bought their own small Christmas tree and stringed lights, by the way, manufactured in Poland, with the inscription on the box “Christmas tree lights – Made in Poland” to the huge delight of both travelers. They also have two red Santa’s hats. Well equipped for holidays, they departed in the direction of Brazil on the morning of December 13. The next stop is the Brazilian Tabatinga.